Is a very cosy and comfortable community Seven Hills is located over 1300 acre of elegantly designed master planned community. Seven hills homes and community boasts some of the most magnificent views in the Las Vegas area. Seven Hills is located just south and just a few minutes from the world famous Las Vegas Strip action. With easy access to Interstate 15 commuters give easy access to all parts of the Las Vegas Valley. 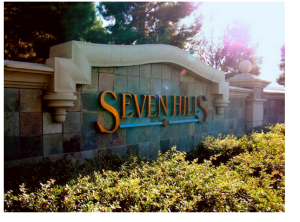 Seven Hills community offers you the Las Vegas Real Estate Buyer. Seven Hills community is a well established master-planned community, offering a serene and beautiful settings – affordable homes and living. The tree-lined streets offer an easy way to get around to the many parks, community center’s, recreational areas, and home developments in the golf communities. Seven Hills is situated up in the foothills of the McCullough (Black Mt.) Mountain Range and built around the magnificent and beautiful 18 hole Rio Secco Championship Golf Course designed by the world renowned Rees Jones. The residents of Seven Hills enjoy beautiful scenery and with proximity to the mountains Seven Hills home owners also enjoy beautiful view of the golf course and a spectacular panoramic view of the sparkling neon lights of the world famous Las Vegas Strip. This is why Seven Hills has long been considered one of the most desirable addresses in the Las Vegas area. Jonathan Abbinante Realtor, can help you with your new Las Vegas home in the Seven Hills Area. We can help you move in to the beautiful Seven Hills area of Las Vegas and make sure that you buy the best quality Seven Hills home. As with other areas of the Las Vegas real estate Market is progressing forward with property value appreciating more and faster then the rest of the United States. We are sure that your new Seven Hills home will appreciate in value as market analysts have projected that there will be no slow down in the Las Vegas real Estate market until at least the middle of 2008. This means that your new Seven Hills home will keep rising in value for at least 2 years. Great news when you move into the Seven Hills Housing market. Deals offered in foreclosure homes for sale in Seven hills Henderson Nevada! For strong closing and representation In the Las Vegas Area. This entry was posted on Tuesday, March 29th, 2011 at 5:23 am	and is filed under Real Estate Articles. You can follow any responses to this entry through the RSS 2.0 feed. Both comments and pings are currently closed.